April in Thailand sees the country in the middle of summer with hot weather wherever you go. Although temperatures are high, Thailand is well-adapted to deal with the heat and visitors will be thankful for air-conditioning in hotel rooms, taxis and shopping malls. April also brings the perfect way to cool down thanks to the Songkran Thai New Year Water Festival. 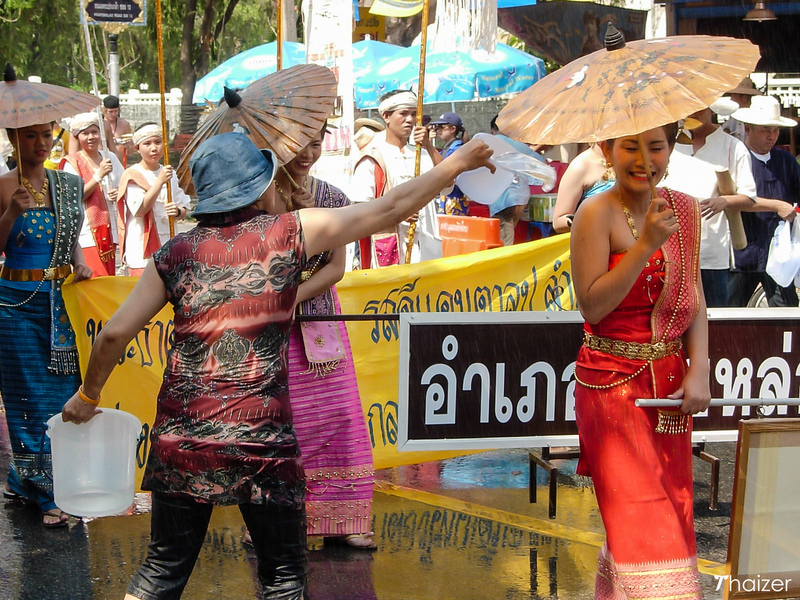 The biggest holiday of the year in Thailand is celebrated with great enthusiasm as people pour water over each other as a way of wishing good luck for the year ahead. April can bring extremely high temperatures throughout Thailand, particularly in the north and north-east of the country. With summer temperatures often nudging 40°C (104°F) it makes sense to try to plan any activities and sightseeing for the morning or late afternoon wherever possible. The April heat and humidity in Thailand can be draining and visitors should drink plenty of bottled water to keep hydrated. Which is the best Thai island or beach resort to visit in April? With April being hot season in Thailand, whichever beach resort or island you choose you can expect plenty of blue skies and sunshine. Showers and summer storms can occur anywhere in Thailand during April, but they tend to be over quickly. Prolonged periods of rainfall and rough seas aren’t the norm in April and boat services run as usual throughout the month. There is no major difference in weather from one coast to the other so choose whichever island or beach takes your fancy. Although average rainfall during April is slightly higher on Thailand’s Andaman Coast (e.g. Krabi, Phuket) compared to the Gulf Coast and the Eastern Seaboard, the amounts are still low. Thailand commemorates the founding of the royal Chakri dynasty with Chakri Day on April 6 a public holiday. The biggest and most widely anticipated holiday of the year is the Songkran Thai New Year Water Festival. Official dates of the holiday are from April 13-15, but water throwing often starts a day or two earlier in a number of locations. There are also some regional variations (such as Chonburi) which sees events such as the Wan Lai Festival celebrated on different dates. Many Thai people working in Bangkok return home for the extended Songkran holiday. Buses, trains and planes heading out of Bangkok to the north and north-east of Thailand tend to be extra busy for Songkran. There are also some destinations such as Chiang Mai which are extremely popular with overseas and Thai tourists heading to the city to celebrate the Thai New Year Water Festival. It’s advisable to book Songkran transport and accommodation well in advance, especially if you are heading from Bangkok to the north or north-east of Thailand. Poy Sang Long is a colourful festival celebrated by the Shan (Tai Yai) people in north and north-west Thailand. Young boys being prepared to be ordained as Buddhist monks are dressed like princes just as the Buddha was in his youth and carried on the shoulders of older relatives. Poy Sang Long takes place in various locations around northern Thailand during March and April. The most famous place to witness Poy Sang Long in Thailand is in Mae Hong Son with the event celebrated over a three-day period on the first weekend in April.